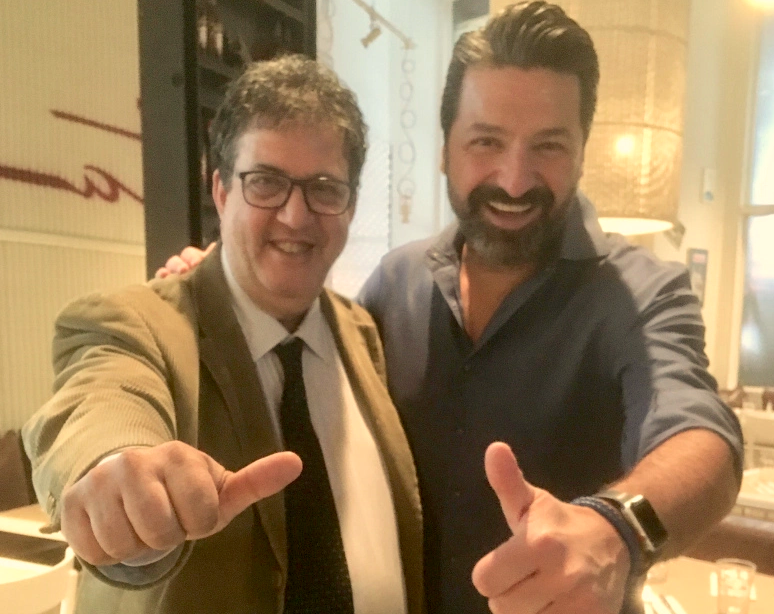 Rosario Procino, the owner of Ribalta, one of New York’s best pizzerias, invited me to attend a tasting and dinner, I like to call the event “Under the Volcano”, the volcano being Vesuvio, sponsored by the Consorzio Tutela Vini Vesuvio. The speakers were Luciano Pignataro, a very influential blogger, food and wine writer. I follow his blog (English) and (Italian) for all things Neapolitan and Southern Italy. The other speaker was Ciro Giordano, president of the Consorzio from Cantine Olivella. 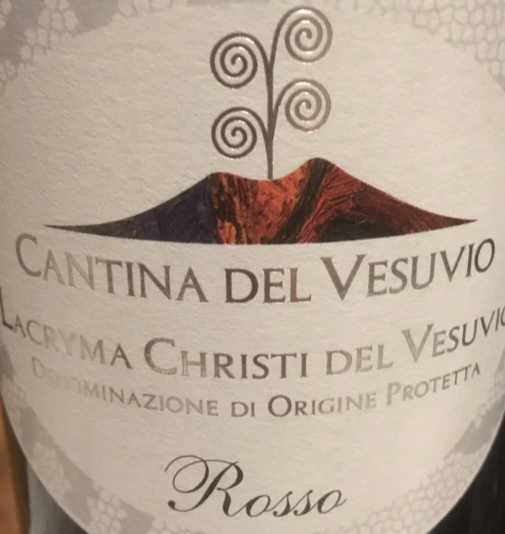 They spoke about the area in general and the different grapes used in Lacryma Christi del Vesuvio such as such as: Caprettone, Catalanesco, Falanghina and Piedirosso. 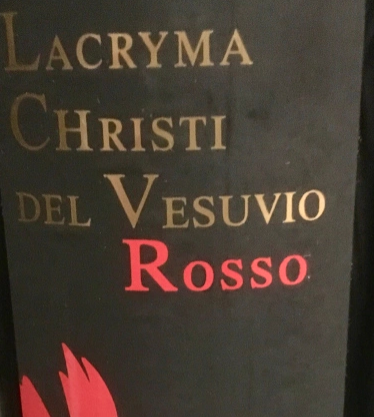 The wines featured would be the Lacryma Christi del Vesuvio DOC Bianco and Rosso. 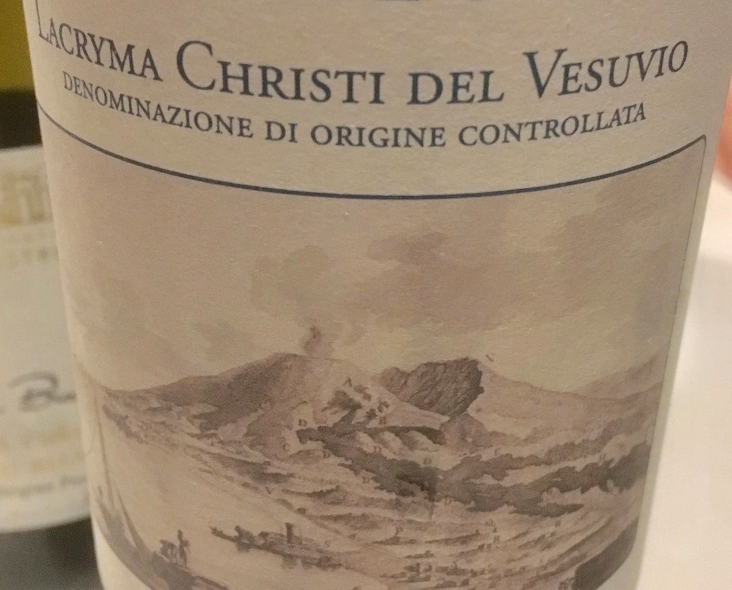 Lacryma Christi del Vesuvio may be the most known wine in Campania. The name means the tears of Christ. Legend has it that when Lucifer was expelled from paradise he stole a piece of paradise to take with him. In his flight he dropped this of piece of paradise and it became the bay of Naples and the surrounding area. When Christ saw this he cried and where his tears fell, Lacryma Christi was born. 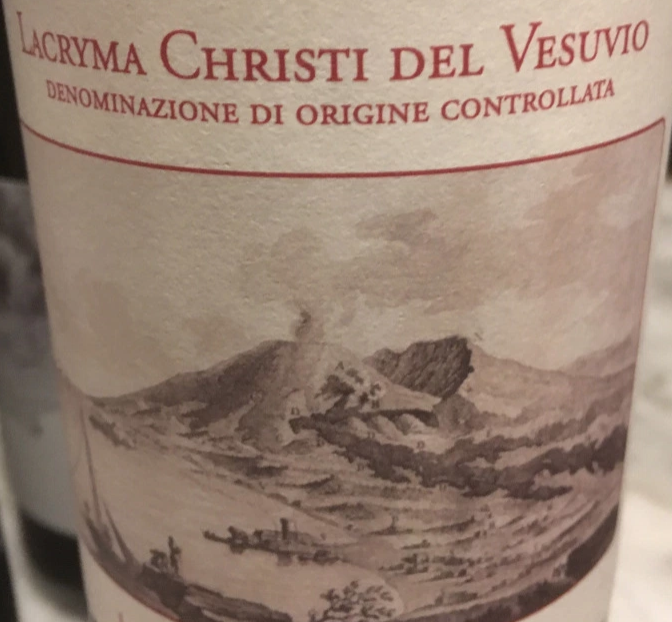 Lacryma Christi del Vesuvio can be made from many different grapes and the producer may change his mix from one year to the next. Starting this year the producer can put the name of the grape or grapes on the label. 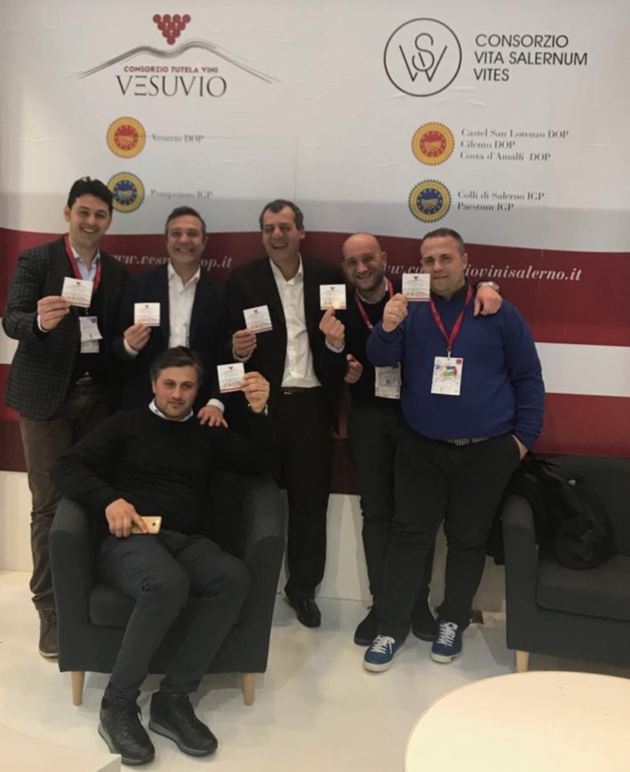 There were many wines at at the tasting but five producers each presented a Lacryma del Vesuvio Bianco and Rosso. Rosario explained the food to go with the wines prepared by his chef and pizzaiolo Pasquale Cozzolino. 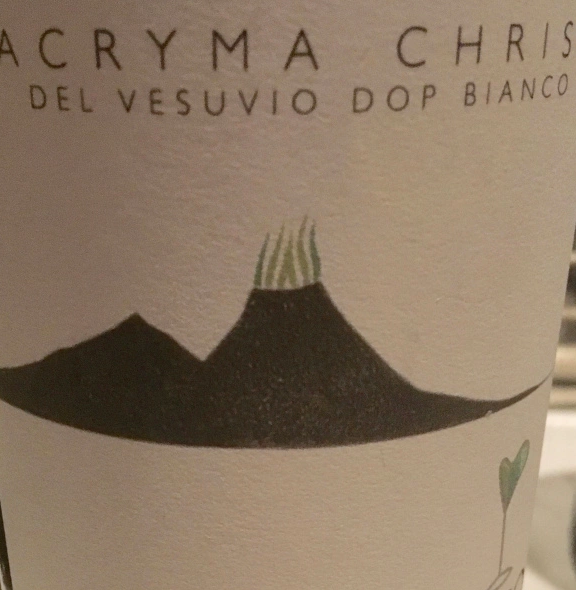 Lacryma Christi del Vesuvio DOC made from 85% Coda di Volpe and 15% Falanghina Bianco. The vineyards are in the Mt. Vesuvius National Park. The vineyards are at 500 meters; the training system is Espalier with guyot pruning. Harvest is by hand. The grapes are soft pressed and fermented is steel at a controlled temperature. The wine has hints of citrus fruit, pineapple and peach and good minerality due to the volcanic soils. Rosso DOC made from 85% Piedirosso and 15% Algianico. The training system is Espalier with spurred cordon pruning. Fermentation is in steel at a controlled temperature. The wine is full bodied with hints of red fruit and spice. 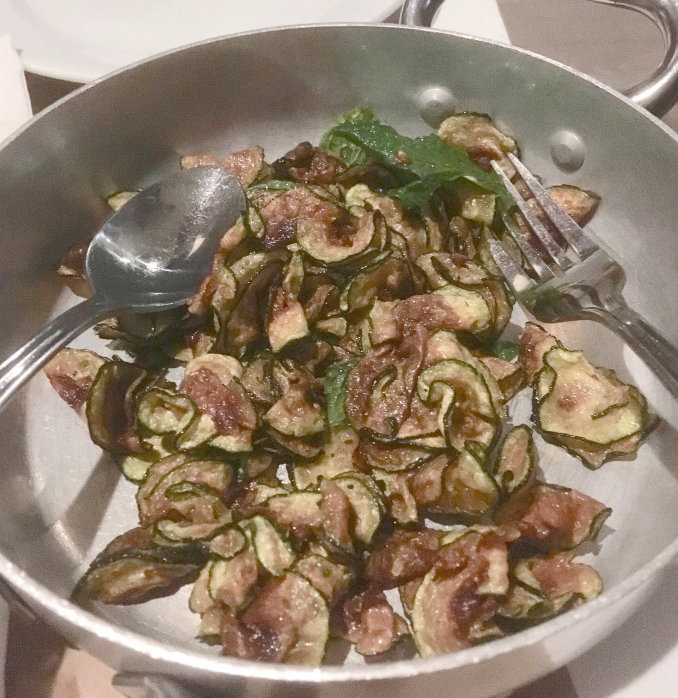 Rosario said this zucchini dish was typical of the area. Zucchini a scapece is thin slices of zucchini fried and dressed with garlic, vinegar and mint. 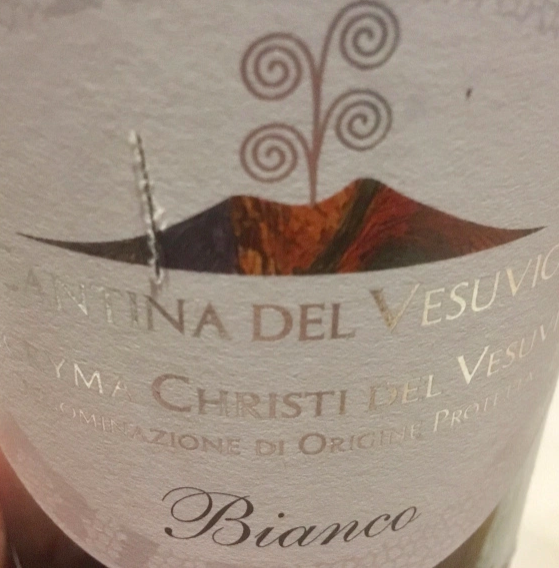 Lacrima Christi del Vesuvio Bianco, “LacrimaBianco,” made from 80% Caprettone and 20% Catalanesca. The vineyards are in the Vesuvius National Park. The vineyards are at 450 meters, the exposure is west, there are 4,000 vines per hectare, the training system is Espallier with guyot pruning. The wines are 10 years old and the harvest takes place the first week of October. Classic white wine fermentation in temperature controlled stainless steel tanks. The wine remains is steel for 3 months and in the bottle before release. 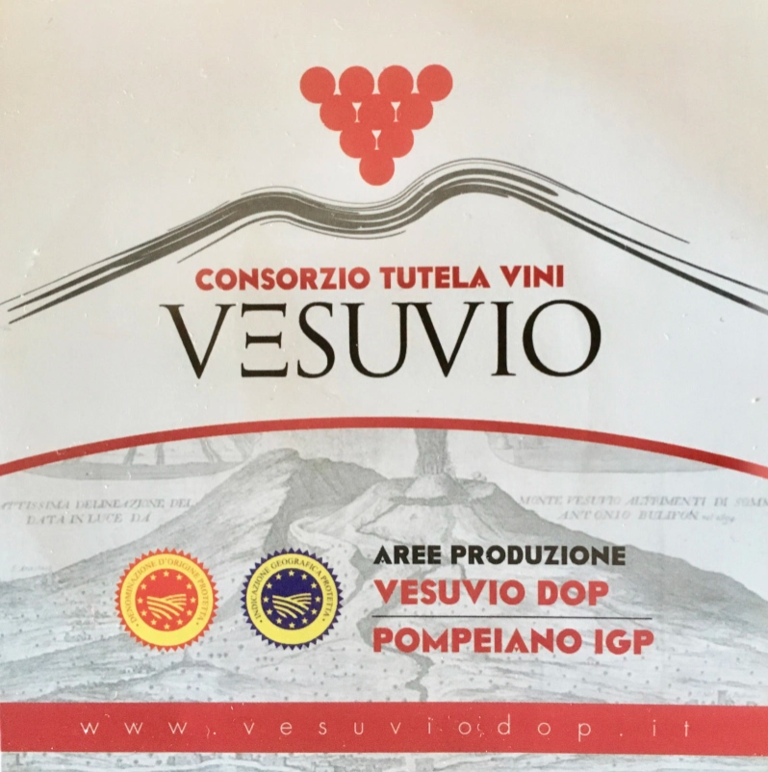 Vesuvio Rosso “VIPT” The age of the vines is 15 years. There is along maceration on the skins in temperature controlled stainless tanks. The wine remains in the bottle for 3 months before release. The wine has hints of red and black fruit with cherry and prune notes and a touch of violet. 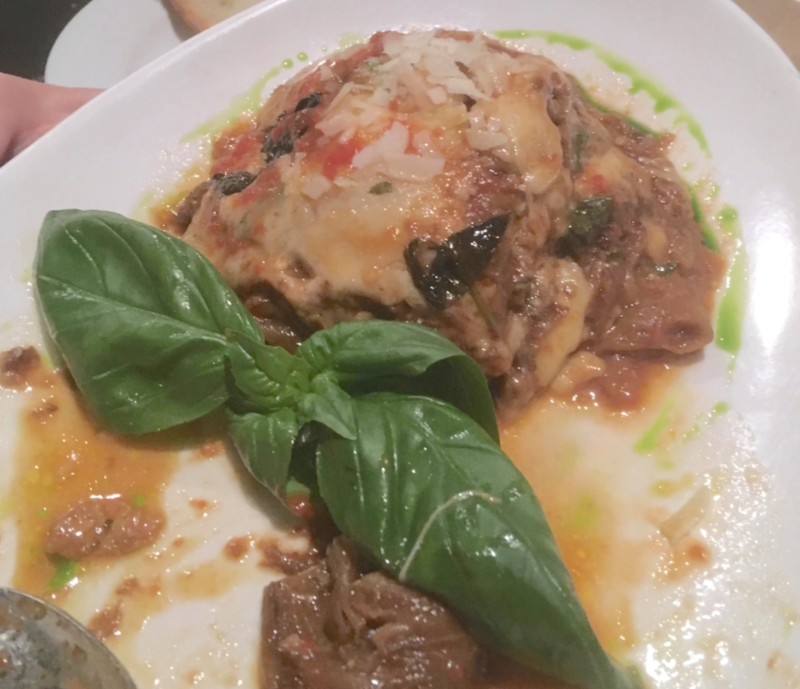 The next dish was eggplant parmigiano, so good I ate most of it before I remembered to take the picture. 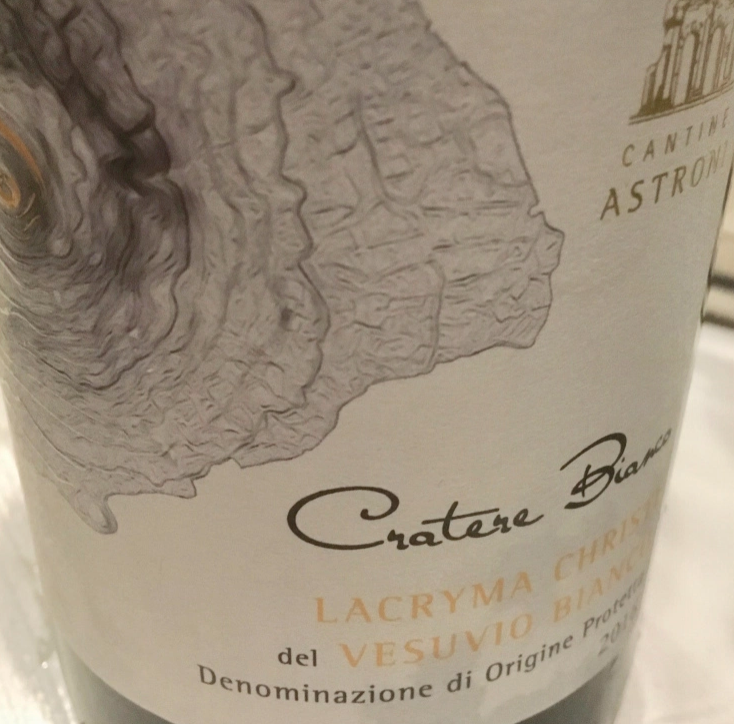 Lacryma Christi del Vesuvio “Cratere” Bianco Made from Caprettone and Falanghina from Agro Vesuviano. Soil is predominately sandy, the training system is low arbour and cordon spur and the harvest is by hand the first week of October. Cryomaceration takes place and the fermentation is in stainless steel tanks for two weeks. Harvest is the first week of October by hand. The wine remains on the lees in stainless steel tanks for a few months. This is an aromatic wine with hints of yellow fruit, apricot and mineral notes. 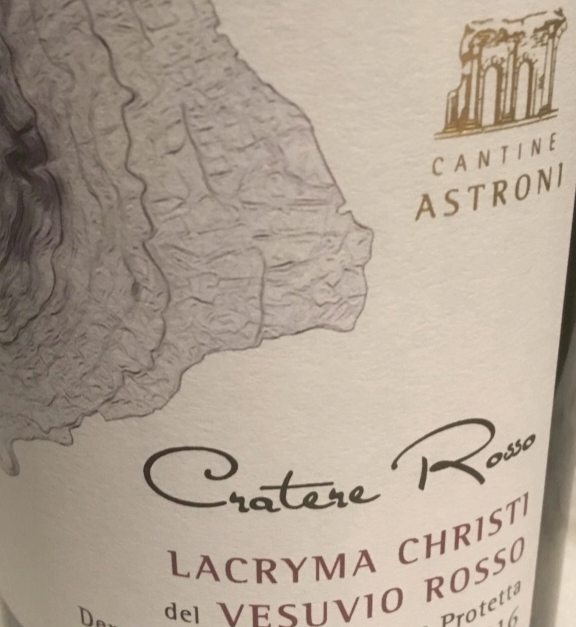 Cratere Rosso made from Piedirosso, Aglianico and Sciascinoso from Agro Vesuviano. The soil is predominately sandy and the training system is low arbour and cordon spur. Harvest is manual in late October. There is a long maceration with delestage and fermentation is for two weeks in stainless steel. The wine is aged in stainless steel and bottle before release. This is a wine with hints of red fruit, violets, licorice and spicy notes. 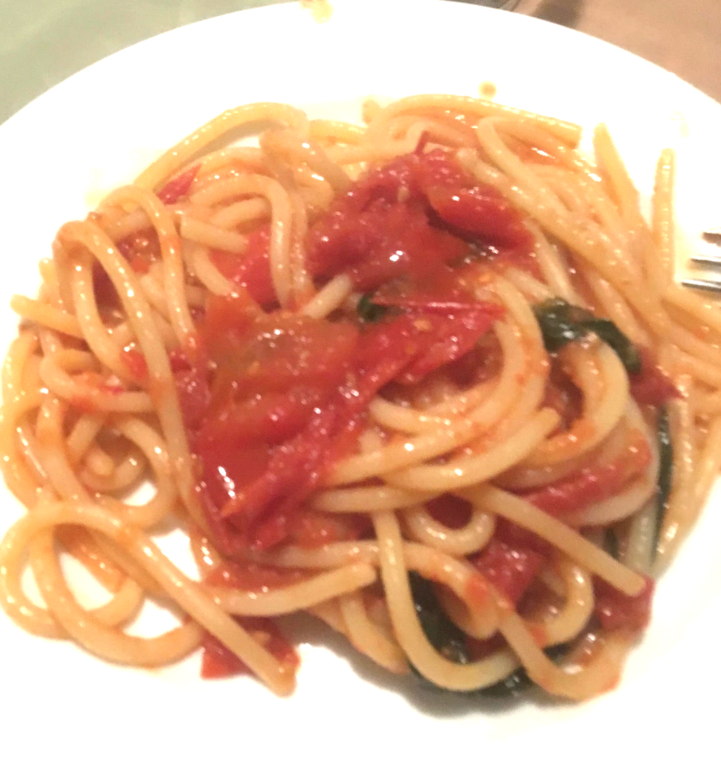 Spaghetti al Pomodoro, Ribalta’s version has been named as the best in New York City. 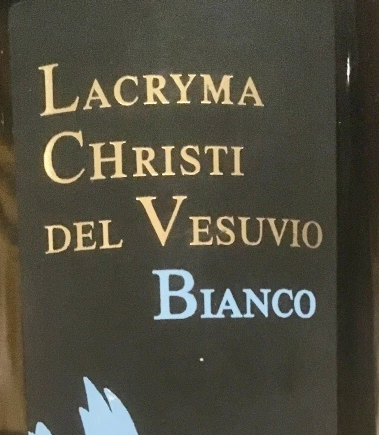 Lacryma del Vesuvio Bianco made from 80% Caprettone, 15% Falanghina and 5% Greco. The Caprettone is distributed over three vineyards located at 30, 120 and 200 meters. Falanghina and Greco are at 30 meters. The Falanghina and Greco are fermented together with a pressing and fermentation without the pomace. The Caprettone is vinified alone with a 24-hour maceration period with the pomace. Then a soft pressing and fermentation takes place without temperature control. Andrea Matrone, the enologist, said this helps to obtain a wine with slightly more intense color and a bouquet of aromas that are more related to the varietal and less to the fruity or floral notes due to fermentation. The wine has hints of citrus, almond and a touch of sage with good acidity. Rosso made from 75% Piedirosso, 15% Sciascinoso, and 10% Aglianico. 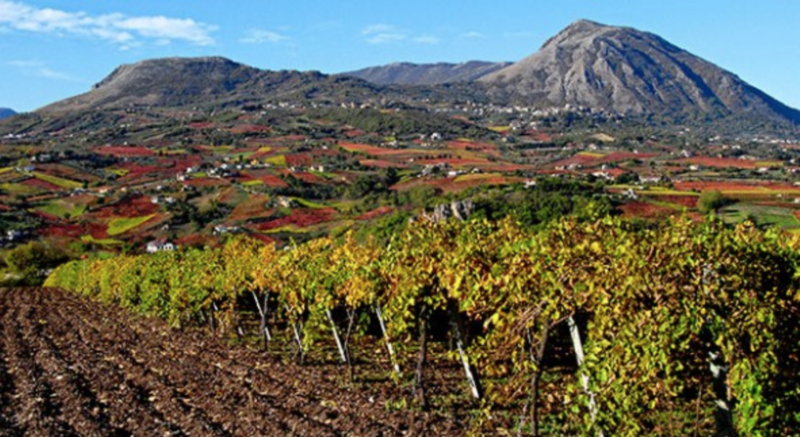 The Piedirosso is cultivated in 3 vineyards located at 30, 120 and 200 meters. The soil is volcanic sand/lava and basalt. Sciascinoso and Aglianico are cultivated at 30 meters. Maceration is for 10/12 days and delestage takes place. The wine is aged in stainless steel vats and tonnenau barrels. The wine has aromas and flavors of red fruit and cherry with hints of spice and a touch of smoke. Lacryma Christi del Vesuvio Bianco made from 100% Caprettone. The vineyard is at 200/250 meters. Fermentation is in temperature controlled stainless steel tanks. This is a fresh and fragrent wine with hints of citrus fruit and a touch of almond. 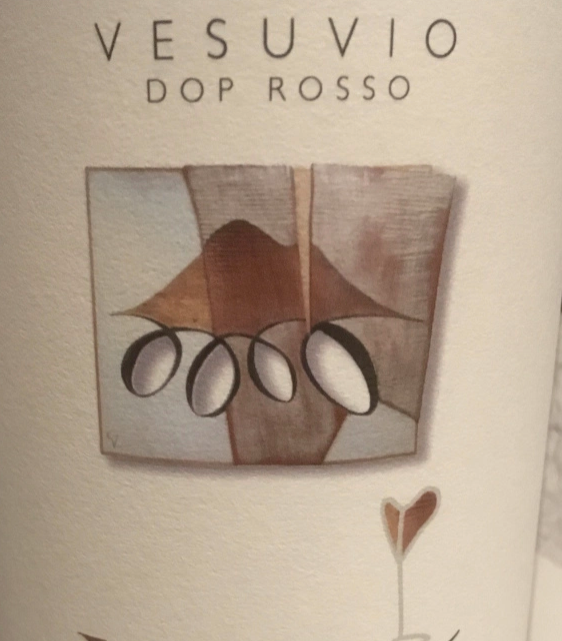 Rosso made from 100% Piedrosso.The vineyard is at 220/250 meters. Traditional red wine fermentation with skin contact takes place. The wine is aged for 12 months in barriques. The wine has hints of fruit, violets and a touch of sage. The winery is located on the slopes of Mt. Vesuvio. And last but not least the famous pizza pala – this is a pan pizza and everyone at the table grabbed a slice as soon as it came out. I was lucky to get a picture. The crust was crisp and the toppings fresh and balanced. Another great pizza at Ribalta. 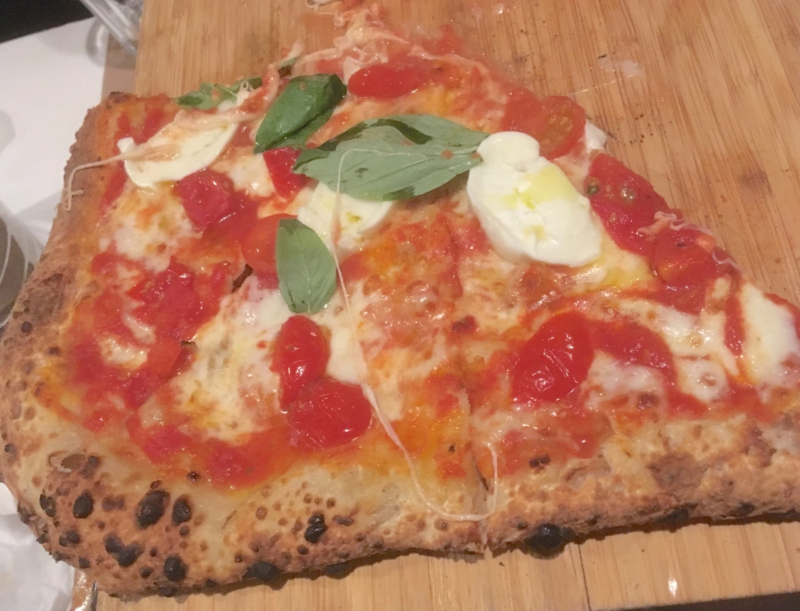 Rosario Procino and Pasquale Cozzolino have brought Naples into the heart of New York to make you experience a one-of-a-kind taste: to taste the true Neapolitan pizza. Forget all that you have known about pizza so far. At Ribalta the ingredients are all the Neapolitan ones: from the flour used for the dough, to natural yeast, to tomatoes, to Buffalo-milk mozzarella from Campania. For those who were born and raised in Naples, pizza is not just food, it is an experience indeed which has that original, true taste. People working at Ribalta are extremely traditionalist as far as dough is concerned: Pasquale only use the mixture of flours for pizza certified by the Italian flour mill “Le 5 Stagioni” and the natural yeast coming from Italy, which makes pizza light and easy to digest. Toppings, instead, are very fanciful and delicate in order to cater to the different customers’ tastes. For this reason our menu also boasts – besides the traditional pizzas – unusual combinations; customers can also ask for customized pizzas, even putting together the ingredients of their own pizza.